On 29 October 2014, Russian Foreign Minister Sergei Lavrov met with Patriarch Tawadros II of the Coptic Church at the Ministry of Foreign Affairs of the Russian Federation. Taking part in the meeting on behalf of the Russian Orthodox Church were Metropolitan Hilarion of Volokolamsk, chairman of the Moscow Patriarchate’s Department for External Church Relations (DECR); Rev. Viktor Kulaga, representative of the Patriarch of Moscow and All Russia to the Patriarch of Alexandria; hieromonk Stefan (Igumnov), DECR secretary for inter-Christian relations; and Rev. Iliya Kosykh, head of the DECR Communication Service. 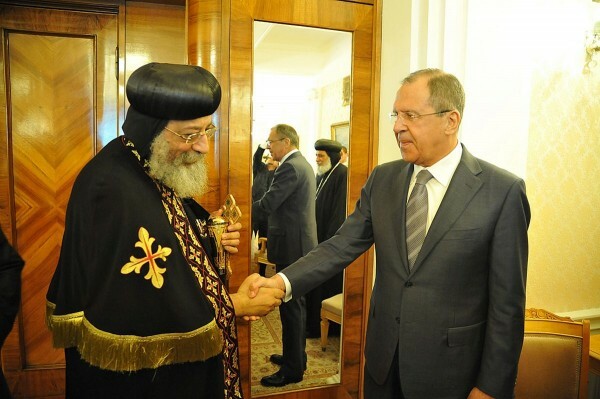 While greeting Patriarch Tawadros, Minister Lavrov underscored that relations between the Churches were a foundation of the development of Russia’s relations with the countries of the Middle East and North Africa. He appreciated the efforts undertaken by the Coptic Church and by its Primate for keeping the interconfessional and interethnic peace in the region. Patriarch Tawadros said that his dream to visit Russia had come true and he was very glad to be here. He said that Christians and Moslems had lived in the region for fourteen centuries, and though they had problems, they had tried to solve them in the spirit of love and life as in one family. The Patriarch believes that the Middle East without Christians will become a source of many problems which can bring about clashes and wars among the big countries of the world. Patriarch Tawadros is convinced that the presence of Christians in the region is a basis for keeping peace and accord there. He gave examples of friendly coexistence of Christianity and Islam in Egypt, of joint projects of religious communities and noted good attitude of the authorities to Coptic Christians. Minister Lavrov noted that the Russia state would always support peace initiatives, including those displayed in the frame of the inter-church dialogue.